I had another kitchen in mind for today, also by Bates Corkern Studio, but while searching for it this petite kitchen, very much in sync with Fall, came across. And boy do I need to say why... due that it's Friday this kitchen's muted and autumn palette reminds me of a perfect weekend getaway in the woods and almost tells me to set the fireplace and open a glass of wine. I'm working this Saturday, so that's when blogging comes in handy, it helps you dream the perfect life. Have a fabulous sunny and crisp weekend! all images via Desire to Inspire. You have read this article Bates Corkern Studio / Fall inspiration / kitchen with the title Kitchen of the week: Bates Corkern Studio. You can bookmark this page URL http://ourpicturewindow.blogspot.com/2011/10/kitchen-of-week-bates-corkern-studio.html. Thanks! 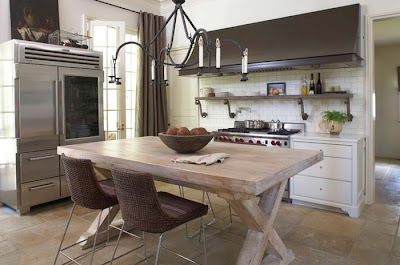 No comment for "Kitchen of the week: Bates Corkern Studio"